The Schmap online guide to Baltimore requested use of this photo, I learned it was included and am so grateful for the exposure. If you need to find your way around Baltimore, MD, maybe this Schmap map will help you out! That looks an awful lot like the Custom House Tower in Boston. 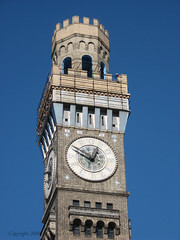 Do you know the height of the Bromo Seltzer Tower? "The design of the tower along with the original factory building at its base was inspired by the Palazzo Vecchio in Florence, Italy"
"From street-level to rooftop, the tower stands 288.7 feet (88.0 metres) high, and was originally adorned with a 51 foot (15.5 metre) tall Bromo-Seltzer bottle, glowing blue and rotating. Due to structural concerns however, the bottle was removed in 1936." All of the above from Wikipedia.